This cartoon from the Cincinnati Rail Splitter correctly identifies the real presidential contest as the Electoral College state-by-state tally, not the national popular vote. Three of the presidential nominees juggle balls labeled with state names. Meanwhile, Northern Democrat Stephen Douglas (foreground) is hit on the head with his own “squatter democracy”—a mocking name for “popular sovereignty,” or the policy of territorial voters deciding the status of slavery without interference from the federal government. 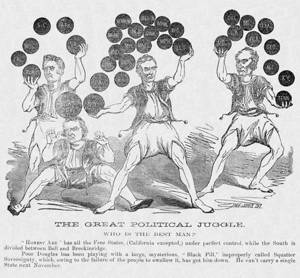 The cartoon predicts that Douglas would win no states in the November election, Republican Abraham Lincoln (center) would win all the free states except for California, and that Southern Democrat John C. Breckinridge (left) and Constitutional Unionist John Bell (right) would split the slave states, with Bell winning twice the number as Breckinridge (10 to 5, with Breckinridge also taking California).